The current piece is darker/subtler in contrast than 24/52, which isn’t totally what I wanted out of it, but I still enjoy it. This piece was created by starting with a painted cloth background which I stamped with lumiere paints. Then, I fused strips of batik onto the background. I zigzag stitched their raw edges down, and then stitched the purple organza halo on top. 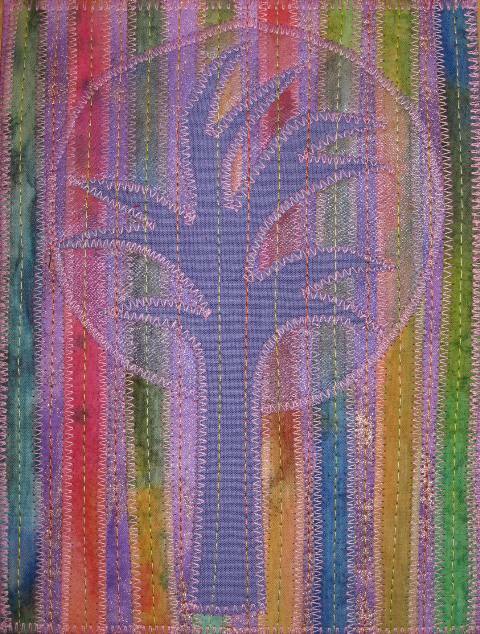 Next, I fused the solid purple tree down and stitched all around the edges of the silhouette. I quilted the piece in a linear pattern in the center and “ditches” of the batik stripes with orange and green variegated threads. I backed it with a piece of hand dyed fabric and finished the piece with a zigzag stitch around the edges. This is my weekly journal quilt 24/52 2008, 6″ x 8″. This piece looks a little shiny in the photo…because it is! I created this journal quilt as a study for the next big quilt in my tree series. The background of this quilt is a wipe rag from some purple painting and stamping that I created using shimmery Lumiere paints. I then layered batik free cut strips on top and fused them down. I also zigzagged the edges to the Peltex base and straight stitched them with a nice thick variegated Sulky thread. I then spray basted a purple organza circle down for the halo of the tree. Lastly, I cut a tree out of fabric that I created with a stamp I designed. I fused this down and then zigzagged all around the halo and tree.